Anyone who lives in or has visited Annapolis has been down West Street, which is roughly divided into “inner” (Church Circle to Chiquapin) and “outer” (Chinquapin to MD Route 2. It is as James Howard Kustler always says in his podcasts about urbanism, “it’s a place that no one wants to be” that is ostensibly that way because it and the associated “muffler shop and fry pit” chain stores cater to people in cars. 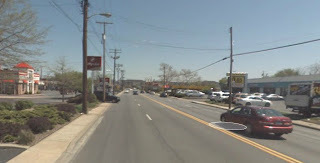 Sure, these kinds of businesses have to be someplace (well they don’t have to be but that’s a matter of opinion that is not the subject of this post), but at the same time, can’t they be more hospitable to non-auto traffic? I am excited about the City of Annapolis Bicycle Master Plan (being voted on at the City Council Meeting Monday February 13 by the way), which calls out the West Street corridor as an area that needs improvement. Additionally, I have applied to be a member of the Anne Arundel County Bicycle and Pedestrian Master Plan Citizen’s Advisory Committee which is looking to improve walking and biking as a viable transportation mode in the County. A confluence of these two plans would occur on outer West Street (the city/county line is Rt. 2). If you have ever ridden a bike down this street you know you are taking your life in your hands (and I said as much at the City Council hearing on the master plan). Problem is that in order to get to that end of town, this is the only way to do it. There are no alternate through streets or paths. 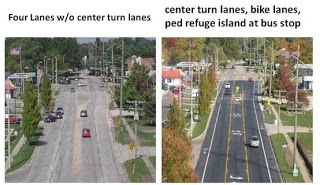 In the spirit of both master plans – pick the low hanging fruit that does not cost much to implement – why not just reline outer West Street (actually all the way from Goodwill where it is only 1 travel lane into the city anyway) and make it look like the right hand side of the image above. Everyone wins: easier to make left hand turns, a decent width bike lane and would not cost very much. Traffic studies have shown that slowing down traffic actually increases throughput, especially when the the speed limit is high (its 35 here) and there are great differences in car speeds. For example when traffic in the left land is stopped for left turns. I think this greatly silences the inevitable outcry of “more traffic jams on West Street!” Additionally, removing the neck down from 4 to 2 lanes at Goodwill would remove a daily traffic jam. So what do you say Annapolis? 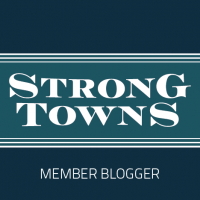 This entry was posted in Urbanism on February 10, 2012 by Alex Pline.